BILLIONAIRE DONALD TRUMP has taken a commanding lead in the race for the 2016 US Republican presidential nomination with the support of 25% in a Reuters/Ipsos poll, giving him a double-digit advantage over nearest rival Jeb Bush. The poll shows Bush, the former Florida governor, trailing at 12%. It is a huge jump for Trump, who announced his candidacy for the November 2016 election six weeks ago — and this despite the criticism political rivals leveled at him for remarks this month belittling the military service of Sen. John McCain, the party’s candidate in 2008. 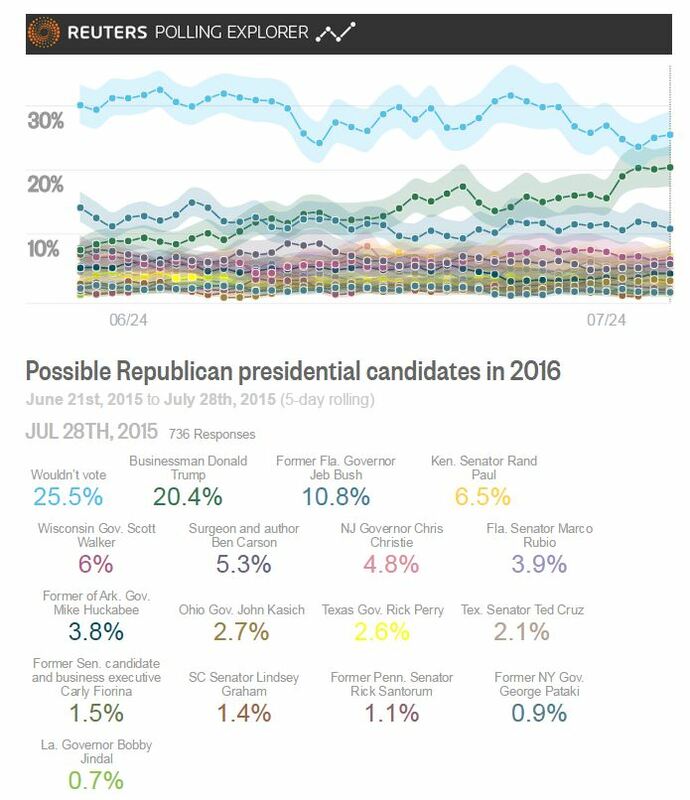 The five-day rolling online poll had Trump at 15% among Republicans on Friday before he rocketed to 24.9% on Tuesday. Trump, a 69-year-old real-estate mogul and reality-TV star, seems to be certain to take the stage at next week’s Fox News debate, which will use national polls to determine which 10 of the 17 Republican candidates in the field can participate. Reuters/Ipsos polling also shows that should Trump mount an independent bid next year and run in a three-way race, he will likely drain support from the Republican nominee and allow the Democrat to cruise to victory. Trump has refused to rule out an independent run should he fail to secure the Republican nomination. In a matchup with Democratic Party front-runner Hillary Clinton and Bush, Trump would tie Bush at about 23% among likely voters, with Clinton winning the White House with 37% of the vote. About 15% of those polled said they were undecided or would not vote. The five-day rolling poll was based on a survey of 425 Republicans and has a credibility interval of plus or minus 5.5 percentage points. The three-way race poll, taken at the same time, used a sample of 1,280 Americans and has a credibility interval of plus or minus 3.1 percentage points. Email “This is really happening - Donald Trump is killing it at the polls”. Feedback on “This is really happening - Donald Trump is killing it at the polls”.